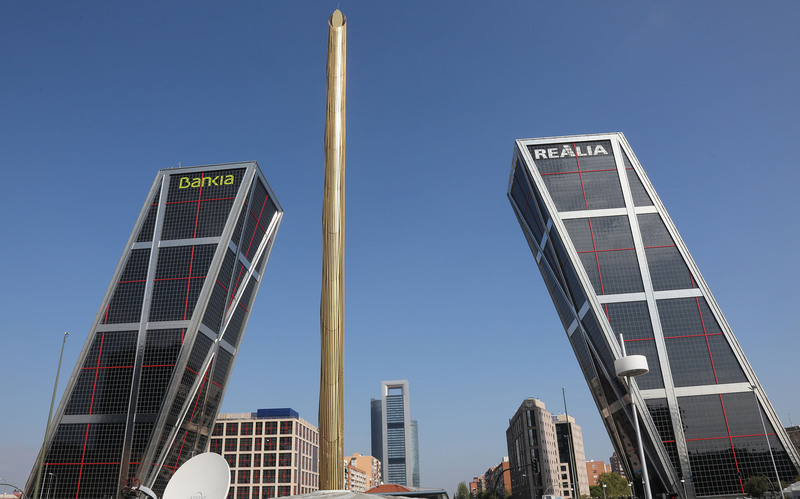 The Needle by Calatrava, or as he says: “The Obelisk” is located at Plaza de Castilla, in the north of Madrid, next to the “Puerta de Europa” towers and the new CT Business Area. It is a present by the Caja bank to the city of Madrid at the occasion of its 300th anniversary. A large movable sculpture formed by a central tube of steel covered by a skin of 462 bronze bars that can be moved by means of a hydraulic system. The central tube rests on an auxiliary steel structure that spans over the different tunnels and galleries located beneath the square. The foundation elements are three concrete piles with a diameter of 1m.